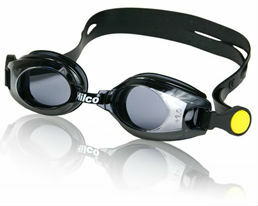 Prescription Swim Goggles by Rec Specs, Hilco and Leader Sports. Our Board Certified Opticians will analyze your prescription and place the best correction for each eye in our prescription swim goggles. Available in both negative - and positive + strengths. When a prescription contains moderate correction for Astigmatism, we will calculate the sphere equivalent of the prescription to provide the best possible vision in a sphere correcting swim goggle. For extra strong prescriptions and/or strong astigmatism correction, our full prescription swim goggles will provide an exact match to your prescription. Available with up to 15.00D total correction. Nationwide, we are the preferred Opticians of eye care providers for their low vision patients.